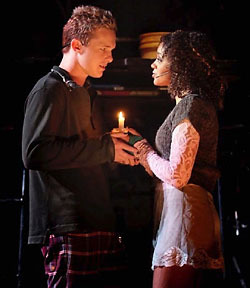 From the day it debuted on Broadway in 1996 through its recent transition to the silver screen, "Rent" consistently connected with the Gen X crowd thanks to its rock n' roll soundtrack, relevant message and general street credibility. Aside from being one of the first musicals in the modern era to pack a significant soundtrack punch, the plot openly (and controversially at first) covers everything from sexuality to AIDS with plenty of references to poverty and artistry thrown in for good measure. On tour, the show is quite similar to the initial Broadway run and is for the most part packed with striking sonics and visuals. But then again, given the time pre-millennial time period, there are still several somewhat dated references (including but not limited to the fashions and those oh so annoying pager beeps that permeate some of the more emotional scenes). Yet even the most grimace-worthy distractions couldn't overpower the general premise of spreading love regardless of race, sexual preference or health status, which remain essential components for any era. Though not nearly the taboo topic it once was, AIDS is still the central force that drives "Rent" and grounds the intertwined love triangles of several New York-based artists residing under the same apartment roof. As each romantic interest is revealed (and in some cases switched between characters), it's slowly reveled who is suffering with the disease and the various impacts they hope to leave with the world before dying. However, those personal battles are just part of the problem, while the other focuses on the money hungry Benny buying the apartment complex where all his former friends live and threatening to turn it into a cyber-arts studio. In the first act, songs like "I'll Cover You" and "We're Okay" paint a picture of joy and celebration, despite the clouds looming in the distance, though shades of reality are also apparent throughout a series of difficult admissions from filmmaker Mark, songwriter Roger, his ex-girlfriend Mimi, plus the rocky pair of Maureen and Joanne, along with the more grounded Collins and drag queen Angel. 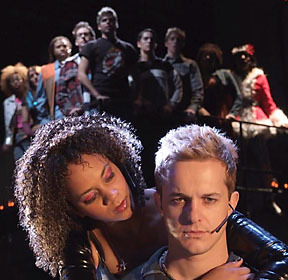 As the signature song "Seasons of Love" opens act two, there's an imminent foreshadowing that death is knocking at several of their doors, but also the insistence to let love be preserved in their memory. When loss finally affects the inner artist community firsthand, it turns everyone's world upside down and almost jeopardizes their friendships. Yet a very close brush with death from another infected with HIV puts everyone back on track (not to mention united in their fight for personal, artistic and even environmental survival). While past tours with the very same story have been criticized for lower caliber performers, this run was filled with top-notch entertainers, particularly when it came to the vocal department. Heinz Winckler (Roger) is a Sony/BMG solo artist who first found fame as the inaugural winner of "South African Idol," while Anwar Robinson (Collins) is likely to be even more familiar with Stateside audiences for his time on "American Idol." In the end, it didn't matter who offered the dialogue or sung the songs that are cult classics in the making because the message of AIDS awareness and unconditional support rang true loud and clear. 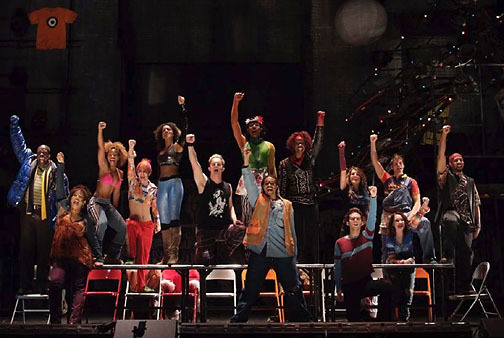 "Rent" runs through February 17 at Chicago's Cadillac Palace Theatre. For additional information, log onto www.broadwayinchicago.com or www.ticketmaster.com.